CHA-NO-YU (literally, hot water for tea), or SA-DÔ (also CHA-DÔ, the Way of Tea), is one of the most highly refined traditional arts of Japan. It has been an important influence on Japanese architecture, landscape gardening, ceramics, and floral arts. Chanoyu has also shaped many of the artistic values and social etiquette observed by the Japanese people. Tea as a beverage and medicine was introduced to Japan from China in the early 700’s by Buddhist monks. Sen no Rikyu (1522-1591) was a Zen lay priest who perfected the tea ceremony as it is known today. The main point in Chanoyu is not the drinking aspect of tea but rather the appreciation of beauty, simplicity, and spiritual tranquility that form the essential principles of Zen. In our more complex and affluent age, Chanoyu has had increasing appeal for men and women worldwide. For the guest, it involves appreciation of the tea room, the utensils used in serving the tea, the scroll or simple flower arrangement in the room, the skill and grace of the host, and above all, the effort the host has made to have his guests spend a moment in time enjoying this unique experience. The host must prepare the tea to the best of her/his ability for Chanoyu is meant to be a harmonious and tranquil expression of friendship. The Chanoyu demonstrations are under the auspices of the San Francisco/Northern California Chapters of the Ura-Senke and Omote-Senke Schools. They can be seen in the Tateuchi Auditorium within the Nihonmachi Little Friends (NLF) building at 1830 Sutter Street, next to the JCCCNC (where the other cultural events of the Festival will be held). Each session will be about 30 minutes in length, and tea sweets and Matcha tea will be served to seated members of the audience. Dating back from the early 17th century, Urasenke Konnichian of Kyoto has preserved and furthered the rich cultural tradition of Chanoyu, or “the Way of Tea.” With the hope of fostering international goodwill through cultural education, Sen Genshitsu Hounsai zen iemoto, head tea master of the Urasenke Tradition of Chanoyu, had traveled extensively to introduce Chanoyu outside of Japan since his first visit to the U.S. in 1951. Since its establishment by Sen Genshitsu Housai zen iemoto in 1981, the Urasenke Foundation, San Francisco Center has provided public service educational programs on Chanoyu and Japanese culture under the direction of Christy A. Bartlett. The Foundation offers the general public an opportunity to learn more about Chanoyu and Japanese culture through direct participation in tea gatherings, lectures, workshops and other events, serve as a resource center for local and visiting scholars and artists, and to offer instructions in Chanoyu. The San Francisco Urasenke Seinenkai (Young Adult Association) was created in 1995 to provide Bay Area Chanoyu students opportunities for camaraderie and the enjoyment of the culture of tea. The San Francisco Urasenke Young Adult Association will conduct Chanoyu presentation in the Tateuchi Auditorium within the Nihonmachi Little Friends building. 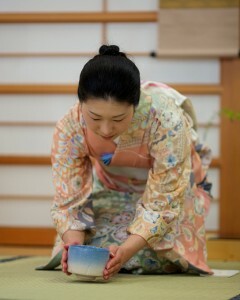 We encourage you to taste the traditional Japanese sweets and a bowl of tea, and learn more about the art of Chanoyu.